Over the years California winemakers have gone from having a diversified product line to a more focused line-up. All California winemakers should be required to read Frank Schoonmaker's and Tom Marvel's outstanding book "American Wines." These fellows laid out what varieties are likely to be best in which regions of The Golden State. They wrote intelligently about the wines of Europe and how the American winemakers should model their efforts. They wrote the book in 1939! During the 1970s vineyards were planted around California without regard to what varieties or rootstocks were suited to a particular location. The determining factor was, usually, money. Those grape varieties costing the most were the ones which were planted, without the grower doing homework to see if that variety was even suitable for his region. Monterey County was heavily planted in the 1970s and growers cultivated Cabernet Sauvignon, for it was the most costly and in-demand variety at the time. The world's largest single vineyard of Cabernet was planted near Soledad. One minor problem: while the grapes achieved enough sugar to be considered "ripe," the fruit never physiologically achieved maturity! Exceedingly vegetal, herbal, weedy wines were made and quickly rejected. Some friends used to grow Pinot Noir right in the middle of Cabernet country. This family cultivated some vineyards in Rutherford and sold the fruit to the Inglenook winery when it was run by Heublein. The grower, who is also a talented and successful winemaker, was delighted. The winery would pay him a premium for providing fruit which weighed in over their minimum sugar requirements. Cultivating an early-ripening variety in a place hot enough to produce the late-maturing Cabernet Sauvignon (of superlative quality) means the fruit was sweet, but ripened so quickly there was little in the way of aroma and flavor! Apparently the Inglenook folks were not sensitive to quality. 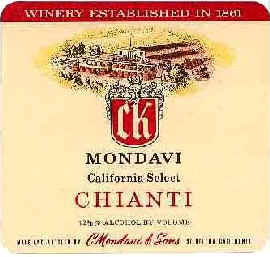 Over the years wineries eliminated slow-moving or less-popular wines. While the notion of "specializing" or "focusing" on a few wines has its merits, it's sad to lose some interesting varieties simply because they're not as profitable as others or because they require more singing and dancing to entice customers to broaden their enological horizons. Not too many years ago people thought Blue Nun Liebfraumilch, Mateus and Lancer's Ross and Mouton-Cadet Bordeaux were "upscale" wines (partly because the connotation of an "imported" wine was superior to a lowly "domestic" offering). I remember seeing Lynch-Bages being sold for $5.50 and Mouton-Cadet was $3.99. People gravitated to the Mouton-Cadet because of the Rothschild name on the label and because they were afraid of embarrassing themselves by asking for "Chateau Lunch-Bags." Pouilly-Fuisse was another famous and prestigious wine for a few years. People used to buy that without regard to who even made the wine--the appellation was the most prominent feature. I remember hearing one importer's claim that "more Pouilly-Fuisse was sold in a year in Los Angeles than the entire appellation is allowed to produce." What they meant was there was a bunch of bogus wine (probably re-labeled Macon-Villages) being sold at a premium since it had the more in-demand Poo-Wee Fwe-Say (many customers would ask for "Polly Fuss") name on the label. It seems Californian wine drinkers have only a modest amount of adventuresome wine-drinking spirit. It takes a certain amount of bravery, apparently, to break away from drinking Merlot and Chardonnay. So...the very fact that you're lurking and looking at this page means you deserve some sort of recognition and commendation. A few California vintners have adventuresome spirits. 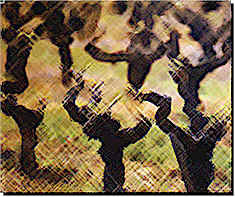 The Pied-Piper these days might be Randall Grahm of Bonny Doon Vineyards. 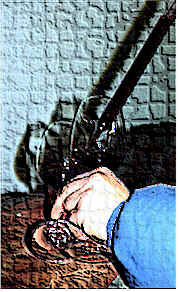 A cerebral fellow, he was, at first, enthralled by Pinot Noir. His vineyard was in the cool (climatically and otherwise) Santa Cruz Mountains. Much to his dismay, he found the climate was too warm for Pinot Noir! So, he embarked upon another project: making wines of varieties nobody else is interested in. Unfortunately for Randall, other winemakers are quick to follow. He started making wines of varieties commonly found in warmer parts of France and other winemakers started making the same sorts of wines. He would find old plantings of Mourvedre or Grenache and would soon be out-bid by others for this fruit. He has been, to some degree, a victim of his own success. There's another group of producers making wines from grape varieties which are of Italian origin, The Cal-Ital Consorzio includes producers making Nebbiolo, Sangiovese, Moscato, Malvasia, Dolcetto and other Italian varieties. At the risk of offending some of the member wineries or winemakers, I wish to point out that many of these folks should consider doing a bit more homework. Simply planting an Italian or Rhone grape variety and vinifying it does not make one a producer of fine Italian or Rhone-styled wines. This is not intended as an indictment of every winery which is a member of either or both group(s). I recall visiting a very prominent producer in Piemonte. I tasted through the entire cellar and found some interesting and delicious wines. The last wine offered was poured "blind." I was asked to identify the type of wine. It was certainly not the usual Piemontese varieties and I was at a total loss for a guess. The winemaker told me it was Syrah. The only thing this had in common with Rhone Valley Syrah was its color. It displayed none of the spice or character of top Rhone Syrahs. I asked this fellow what Rhone Syrah wines he admired. It turns out he had never tasted a French Syrah!!!! How can you make a wine in the style of the "benchmarks" when you've never tasted a wine which can be called a "standard?" The cost of producing wine in California is totally out of control. While it's nice to support the local industry, when the wines cost several times the price of benchmark wines from Europe, for example, many consumers find it difficult to pony up $30 for Sangiovese wines which are not as fine as good, $20 Tuscan Chianti Classico. I'm not trying to discourage consumers from experimenting with the local wines. I am pointing out that this segment of the wine industry is in its infancy. Winemakers need more experience with the benchmarks before they'll be able to achieve the "target." Visit the best winemakers in the world and you will, with but a few exceptions, find enologists who are familiar with viticultural practices and cellar treatments in various regions. The top estates in Bordeaux, for example, know what sorts of Cabernets are made in the New World. The West Coast's best Pinot Noir producers know what goes on in Burgundies best cellars. There are many Cal-Ital folks, for example, who know very little about the Italian varieties they're producing. One person was speaking about Tuscan Dolcetto wines (uh, the Piemontese make Dolcetto, for the most part). I don't mean to put a damper on things. This page started off as a bit of a celebration of diversity. Check out the Cal-Ital Consorzio or the Rhone Rangers....both groups (we can't call them "organizations, now, can we?) have web sites.